These days, if I get asked to describe my diet, the shortest answer is that I’m ‘mostly paleo’. ‘Paleo’ is a way of eating that is loosely based on what our paleolithic ancestors ate. In short that includes meat, poultry, fish, vegetables, fruit, seeds and nuts. For a more detailed explanation see 3 Reasons I (Mostly) Eat Paleo. Anyway my ‘mostly’ qualifier is because I choose to include a few items that strict paleo followers don’t, such as dairy and legumes. The other exception I make is quinoa. While not technically a grain, quinoa tends to be shunned by the paleo folks. I, however, do quite like to have quinoa from time to time because basically it’s delicious. It also happens to be higher in protein than most grains and so it’s less carb heavy. It’s also gluten-free. Anyway, I’ve really noticed over the last few years how readily available quinoa has become. One of the most popular blog posts on Stonesoup is 12 Things You Should Know About Quinoa. Another thing I’ve noticed about quinoa is that most recipes instruct you to cook it using the absorption method which I find a bit ‘hit and miss’. 1. Bring a medium pot of water to the boil. 2. Meanwhile, place quinoa in a fine sieve and rinse well under running water. Drain. 3. When the water is boiling, add the quinoa and simmer for 10-12 minutes or until quinoa is tender. 4. Drain and allow to sit in your strainer for a few minutes for the steam to disperse and allow the quinoa to dry out a little. Serve or store in the fridge. It also freezes well. Then have a look at 12 Things You Should Know About Quinoa. Inspired by Rodney Dunn’s super lovely book ‘The Agrarian Kitchen’. It was Rodney who gave me the idea to shallow fry the kale, and I just love the result. So different from the texture of kale when it’s wilted. Actually, I’m just thinking you could probably get a similar effect by baking the kale with a good drizzle of oil, in a similar manner to kale chips… will have to add that to my list of ideas to try out! 1. Heat oil in a large saucepan and fry half the kale until crisp. 2. Drain the kale on paper towel while you fry the remaining half. 3. Transfer kale to a serving platter. Scatter over the quinoa. 4. Squeeze over a good drizzle of lemon juice and season well. 5. Top with dollops of ricotta. paleo – replace quinoa with almond meal or finely chopped nuts and use coconut oil to fry the kale. And see dairy free and vegan options below for ideas to replace the ricotta. less oil – saute the kale in a few tablespoons oil instead and remove the word ‘crisp’ from the title. dairy-free – replace ricotta with poached eggs or scrambled eggs. vegan – replace ricotta with hummus, cashew butter, tahini or chunks of avocado. different cheese – replace ricotta with goats cheese, creamy blue cheese, shaved parmesan or sliced camembert or brie. A stinky washed rind would also be lovely. no quinoa – replace quinoa with whatever cooked grains or legumes you have. Green lentils, barley or brown rice would be my first choice of substitutes. But chickpeas or white beans would also work. carnivore – serve as a side to roast chicken or a juicy lamb chop. different greens – replace kale with spinach, chard, silverbeet, collard greens or any other greens you have handy. This looks so good, yet so simple! What a wonderful idea for an easy evening meal when you’re not feeling super motivated! Love how you combine such basic ingredients to make a real meal! Thanks for the inspiration! I love your posts! I find this way of cooking quinoa very interesting. I’ve been using the method laid out by Lesh Karan, The Mindful Foodie, and it has been working very well. She uses a little more water than is usually specified. 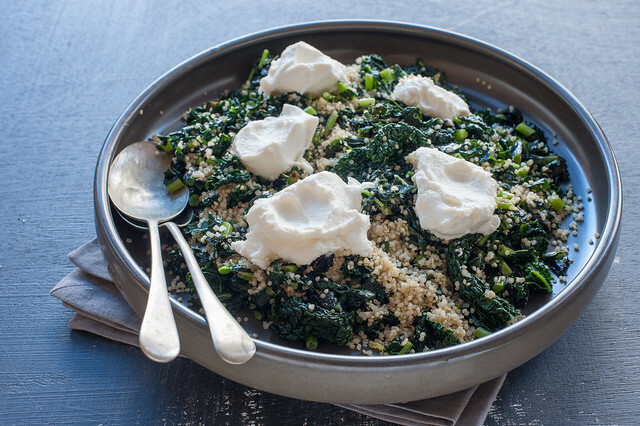 This recipe for kale and quinoa sounds absolutely wonderful. It has occurred to me that another way to achieve the crispy kale is to toss the leaves in a little olive oil & black pepper and bake at 450º F. until crispy (based on how my roasted Brussels sprouts turn out). I’m guessing that would take 15-20 minutes, possibly more, but I’d start checking at 10 minutes. I’m really looking forward to trying this. I love my basic rice cooker, now used for quinoa and occaisonally polenta. Once you get the water ratio correct, it cooks easily and perfectly. My Englishman made this for me tonight with the addition of bacon – chopped up, fried and stirred through. Totally yummy! I noticed that you use beans and lentils in your recipes, I thought paleo was no grains or beans? I’m confused. YOu’re right Susan, strict paleo followers don’t eat grains or beans.